In mere days now, DeLand Showcase starts. The new event closes out the year's shows. Find out more at their website. 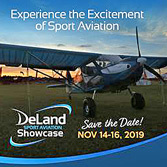 DeLand is a thriving year-round sport and recreational flying airport. It has very long been established as one of the world's premiere skydiving centers. More than 30 parachuting-oriented enterprises employing hundreds of people keep DeLand humming all year with skydiving activity. It is known around globe by enthusiasts. Matter of fact, the timing of the DeLand Showcase leaned heavily on what Showcase director Jana Filip found upon collaborating with the skydiving community as she chose a date. Early November offers reasonably predictable weather and, true to form, the first two years of this show were wonderful with temperatures in the low 80s and lots of blue sky. I have my fingers crossed for a repeat of this year, but its hard to dispute years of carefully kept records by the skydivers — who also depend on good weather. Skydiving at DeLand never stops but leaders welcomed the new event and coordination is good, thanks significantly to airport manager and longtime pilot, John Eiff, who competently manages activities. In fact, the day after Showcase closes on Saturday, skydiving erupts into its own big event. For a few days, though — November 1-2-3 — Light-Sport Aircraft, light kit aircraft, and ultralights are the main attraction. Beyond Showcase and a gazillion skydivers, DeLand is an active field. A brand new terminal building attests to both the activity level and John’s management skill. 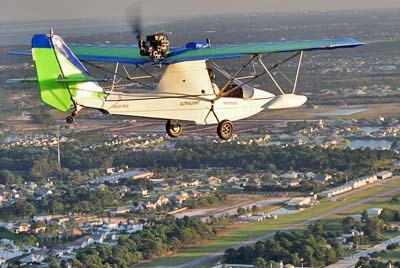 The central Florida airport is home to Aero Adventure, makers of the Aventura line of seaplanes that you can afford. OK, affordability is different for everyone; I get that. Yet if you want a new seaplane, Aero Adventure is unquestionably the place to go for a good value. Their top-of-the-line S17 Aventura retails for $112,000. If you price compare, you will quickly find that even this premiere model from Aero Adventure is far less than any other new seaplane. Here's what the company says, "Our S17 is the top of the line when it comes to Aventura flying. It has a fuel injected, computer controlled, 117 horsepower engine. coupled with an infused hull. This aircfraft weighs under 900 pounds and can carry 600 pounds all day!” Their powerful S17 may be the flagship, but Aero Adventure has much lower cost alternatives. These are all assembled from kit, for now, but the project is not so time consuming and they offer a build center to help. 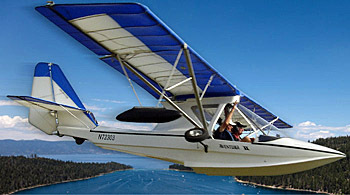 In addition to their side-by-side two seaters, the company is returning to the one-place seaplane market. 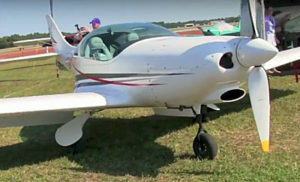 "The Aventura UL is a blast to fly using the MZ 201 engine and with no pilot license required makes for a very popular plane," reported Aero Adventure. Those with a smaller budget should pay extra attention as the opening price of $25,000 is quite remarkable for a seaplane. "Yes, that's right, [we're building] a single seater,” they said. “We are in the process of assisting some great Aero family members making one of the most awesome single seat aircraft on the market!" They promised to keep me advised and I'll report more as this emerges. Under leadership from Alex Rolinski, the Florida company has been exhibiting great energy in the pursuit of its enterprise. Check out the full line of Aventura seaplanes at this link. They are also doing more than building airframes. To further their enterprise they now offer pilot training, probably a smart thing for a company in the seaplane business. Aero Adventure said, "Welcome Howard 'Buddy' Fleming, our Chief Flight Instructor. Buddy has many years flying various aircraft and has mastered the Aventura! 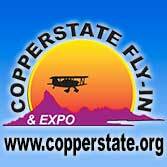 We offer tailwheel and amphibian endorsements, as well as Sport Pilot licenses." DeLand airport is also home to another bargain, the Aerolite 103 from U-Fly-It but that's a story for another post. Meanwhile I hope to see you at DeLand Showcase 2018 in just a few days! In mere days now, DeLand Showcase starts. The new event closes out the year’s shows. Find out more at their website. 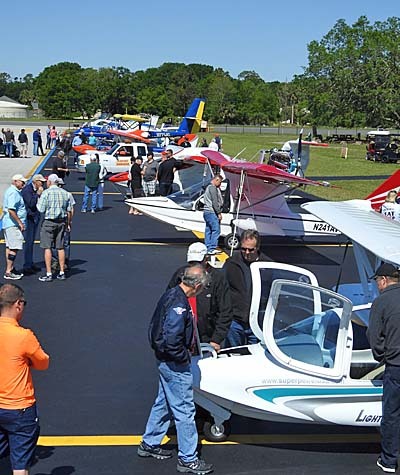 DeLand is a thriving year-round sport and recreational flying airport. It has very long been established as one of the world’s premiere skydiving centers. More than 30 parachuting-oriented enterprises employing hundreds of people keep DeLand humming all year with skydiving activity. It is known around globe by enthusiasts. Matter of fact, the timing of the DeLand Showcase leaned heavily on what Showcase director Jana Filip found upon collaborating with the skydiving community as she chose a date. Early November offers reasonably predictable weather and, true to form, the first two years of this show were wonderful with temperatures in the low 80s and lots of blue sky. I have my fingers crossed for a repeat of this year, but its hard to dispute years of carefully kept records by the skydivers — who also depend on good weather. Today I got a good look at the new Aventura S-17 built in DeLand, Florida — also home of the Aerolite 103 and the DeLand Showcase …plus a large volume of sky diving. In a word, S-17 is hot! One word is not enough, though. This light kit seaplane is also an unusually good value for a long-proven airframe that Aero Adventure has significantly beefed up. The business is Aero Adventure, run by Alex Rolinski who bought the well-known design five years ago. He's a high-energy fellow who quit his bank officer job to go full time and the operation has plenty to keep him busy. S-17 gets its name from the use of a AeroMomentum Suzuki-based engine outputting 117 horsepower. By using an infusion process rather than hand layup fiberglass, Aero Adventure reports saving substantial weight while maintaining strength. “Yes, it’s more work work to use this method,” said Alex but the time consuming process more than offsets the 30 or so extra pounds of AeroMomentum’s AM 15 compared to a Rotax 912. In addition to a new technique building the hull, Alex noted that the entire aircraft has been put through a computer design analysis that evaluates every airframe component. This knowledge provided direction on beefing up the main square tube that is the gear attachment point and a key member of the lower fuselage. The root or keel tube and the main engine support tube have also been beefed up to accommodate the powerful engine that is secured with 16 bolts. The added power gives S-17 Aventura spirited performance, especially given its lighter-than-most airframe. “I would put up this aircraft up against any other seaplane,” Alex stated. He indicated water runs are shortened and his climb rate increased such that S-17 can operate comfortably out of relatively small lakes. OK, so S-17 performs well, but I imagine you didn’t forget the low price comment. Earlier reports have described pricing for a basic Aventura kit that places a seaplane within reach of many budgets — from $50,000 to 60,000 (in early 2018), depending on equipment chosen. That’s an exceptional value that all can see. For $90,000 you can buy a very well equipped Aventura Including the 117-horsepower AeroMomentum AM 15 Suzuki engine, a full instrument panel with ADS-B in and out, and other features. 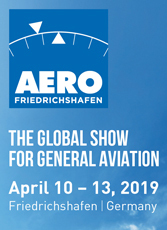 The company figures to assist four lucky buyers each year as they prepare one factory-built demonstrator for airshow use with a plan to sell the showplane by the end of the event. Indeed, one lucky customer who travels to Sun 'n Fun 2018 can fly away in the one I saw. That's another good reason to attend the spring's big airshow. 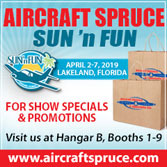 Since the company displays at four shows per year, you may miss Sun’n Fun 2018 but Alex said you can try again at DeLand Showcase, AirVenture Oshkosh, or Sebring Expo 2019. Limited production has proven effective for other producers and that should be especially true with S-17 price well below $100,000 for a well-equipped and powerful seaplane. If you want to put your name in early for the one S-17 available at Sun’n Fun 2018, contact Aero Adventure. I also got a chance to see WingBug in action. 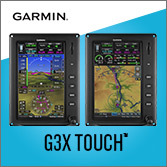 This self-contained, easily-attached exterior unit can wirelessly transmit flight and navigational data to an iPad in the cockpit. WingBug is offered by a company affiliated with Aero Adventure; I’ll have more about that in another article. Today I got a good look at the new Aventura S-17 built in DeLand, Florida — also home of the Aerolite 103 and the DeLand Showcase …plus a large volume of sky diving. In a word, S-17 is hot! One word is not enough, though. This light kit seaplane is also an unusually good value for a long-proven airframe that Aero Adventure has significantly beefed up. The business is Aero Adventure, run by Alex Rolinski who bought the well-known design five years ago. He’s a high-energy fellow who quit his bank officer job to go full time and the operation has plenty to keep him busy. S-17 gets its name from the use of a AeroMomentum Suzuki-based engine outputting 117 horsepower. By using an infusion process rather than hand layup fiberglass, Aero Adventure reports saving substantial weight while maintaining strength. “Yes, it’s more work work to use this method,” said Alex but the time consuming process more than offsets the 30 or so extra pounds of AeroMomentum’s AM 15 compared to a Rotax 912. Hammerhead "canard sponson" — Although it looks like (and is) an add-on feature, this could easily catch on for Aventura buyers and current owners. Dispensing with the wing-mounted sponsons you see in the nearby photos, their canard sponson offers more than a cool look. These sponsons do the same job as the wing-mounted ones, namely keep the wings out of the water on turns or in moving water. However, since you can also walk on them, they aid entry, give you a platform in the water — for fishing, as one example — and they eliminate the drag of the tubing structure to hold the wing versions. "They actually develop a small amount of extra lift," said business owner Alex Rolinski. This is no Icon A5-inspired idea. The canard sponson idea was first conceived under the leadership of Carlos Pereyra, a previous owner of this company who was something of a guru about fiberglass construction. The prototype was first fitted in early 2000 on a 1998 Aventura for a kit builder who wanted to explore the idea. The original was built of fiberglass and used an interior aluminum tubular structure. It also had extra fuel in the sponsons, but when Alex and his group brought back the canard sponson, they removed the fuel tanks. Aventura carries plenty of fuel in a tank aft of the seats. "Aventura with these canard sponsons flew fine," added Alex, "but the assembly was heavy." Eliminating the fuel tanks considerably lightened the component. "They are made of very dense and very light foam," said Alex, "The construction uses technology borrowed from boats and is very strong." Installation can be done to older Aventura seaplanes. Two 2.25-inch holes are cut in each side of hull but this is not a structural issue as the hull is independent of the airplane's structure. Nothing is fiberglassed to the hull but the assembly conforms with a snug fit. "One aluminum tube runs under your knees and another behind the seat, continuing through the hull to protrude on the other side," explained Alex. The canard sponsons extend 43 inches from each side. They have a taper from 44 inches of chord to 33 inches near the sponson. This is an all-new sponson design; it is not the wing mounted one moved inboard. "They work well in water and in-flight cruise," Alex noted. Drag is reduced due to component's overall shape as it eliminates support-tube drag from the original wing-mounted sponsons. Aventura's retractable wheels tuck behind the sponson showing slightly above the upper surface. "The sponsons have no effect on turning; you still maneuver in the water with rudder and prop blast." Alex Rolinski (R) flies with Gabriel Lapilli in an Aventura II. New Front Deck & Instrument Panel — "We have a new nose deck that you can identify with its extra hump and a larger hatch," Alex observed. A nose cavity allows a limited space for some cargo items. That new nose deck integrates with the instrument panel and Aero Adventure has some news about that as well. "When you choose one of AeroMomentum's engines, wiring is simpler, freeing up space in the panel," Alex said. Aero Adventure will also wire the panel for those that prefer not to tackle this job. Many homebuilders choose this — indeed, Aircraft Spruce has a whole division that will prewire panels for builders (see video on this) — so it fits in FAA's task-based method of determining compliance to the so-called 51% rule. Still More Developments — Other new work in development is fiberglass ribs in lieu of slide-in tubular ribs. "These do not change the wing shape or profile," said Alex, "it's still a Hershey bar-style wing." "With more than 200 aircraft flying we often hear from current customers and new customers who bought used ones," Alex added. He reports a fairly active overseas market as well as American customers. Support for Buyers — Beside making airframes in kit form, Aero Advenure does regular refurbishment of previously-built Aventuras. "We have two Aventura IIs in inventory right now. One is a 2006 model with just 74 hours on it; another is a 2009 model that has close to 400 hours logged," Alex said. I predict these won't last long but Aero Adventure will happily make more at their DeLand, Florida location (right next door to Aerolite 103 manufacturer, U-Fly-It). 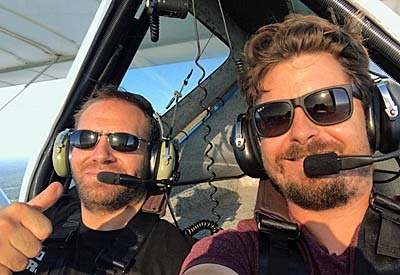 If you need training, Aero Adventure has a new certified flight instructor joining the team to offer flight training, transition training, and seaplane ratings. 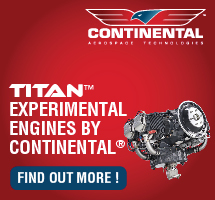 The company is organizing a club to allow such training in Experimental aircraft. Want your own Aventura seaplane? You can buy from inventory or order the kit and start work on a brand-new Aventura. The airframe without engine is $31,000 but you can buy any of 19 assemblies and get going without investing the entire piggy bank. Contact Aero Adventure and see how much fun water flying can be. Let’s make an important point right up front. Seaplanes cost more than land planes. 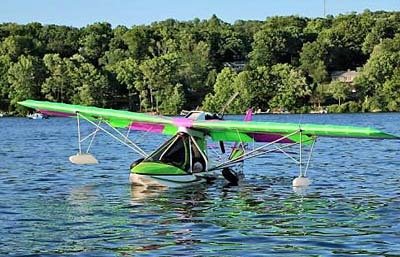 A fully-built, ASTM-compliant LSA seaplane starts at $150,000 and can go way up from that point. With a boat hull and retractable gear, of course, these water birds cost more to manufacture. Must seaplanes be so costly? Fortunately, no! Aero Adventure manufactures a surprisingly affordable light seaplane kit. With the Suzuki-based AeroMomentum engine, you can get an Aventura in the air for less than $50,000 …yep, nose to tail, tip to tip, including a basic panel and powerplant for $49,000. 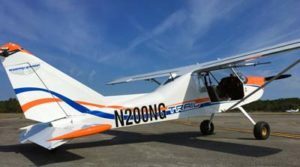 Elect the super-popular Rotax 912 and the cost rises a bit to $55,000, at which level Aventura remains one of the major bargains in light aviation. Learn more about the AeroMomentum engine in this video. AeroMomentum has a few choices for you, Alex indicated, including their 100 horsepower AM 13 model or the 117 horsepower AM 15. 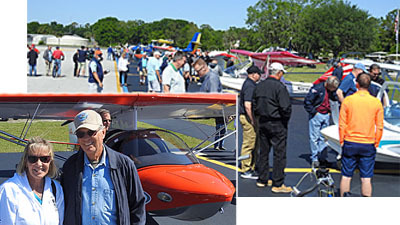 The first-ever DeLand Sport Aviation Showcase finished on a high note with a sold-out flock of vendors giving kudos to event director Jana Filip and her team. I spoke to most exhibitors and heard zero complaints. By itself that's rather unusual. Perhaps they were cutting the new show some slack but more likely their enthusiasm was because the show had indeed been well executed. One smart decision was to pick dates near the gigantic National Business Aircraft Association (NBAA) show that occurred November 1-2-3 at the Orange County Convention Center in Orlando. 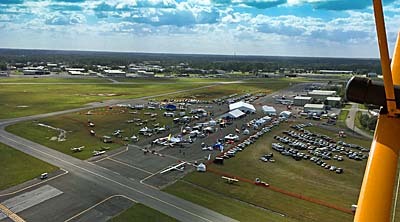 The two events could hardly be more different, but NBAA attracts all the main aviation publications. DeLand hoped to draw some of these journalists since they were in the area anyway. With visits from AOPA Pilot, General Aviation News, AVweb, Aero-News Net, Plane & Pilot, Flying magazine plus a number of free lance writers and photographers, I'd say this date decision was a resounding, over-the-top success. Look for the work of those journalists as uploaded or printed. Even though it was a tail-end-of-the-season show, DeLand attracted some products Americans had not seen before this year. 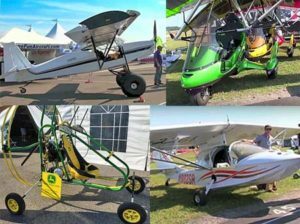 These include JMB Aircraft's VL3 and Russia's SP30 STOL that first debuted in the U.S. at Oshkosh 2016 plus the Sky Tractor and a novel new avionics device called WingBug. In addition, we saw the first installation anywhere of Dynon's new HDX. Installed in the panel of a new CTLS now produced by AeroJones Aviation, we shot a video with Kirk Kleinholz, airshow tech guru for the west coast supplier of the most popular glass screens in Light-Sport Aircraft. The new unit builds on the wonderful success of SkyView with more easily operated physical controls plus a slicker-than-ever touchscreen operation. Watch for the new video. JMB Aircraft attracted attention with their retractable LSA-like aircraft. I've seen this company in Europe at the Aero Friedrichshafen show. They are impressive marketers and they wish to use those skills to promote their faster model that smokes along at 145 knots propelled by the 100 horsepower Rotax 912 engine. Russia-built SP30 STOL is clearly based on Zenith's 701/750 series although closer examination reveals a number of changes and such attributes as fully-bucked or solid rivets. A very sturdy looking machine, the example at DeLand had fat tires with chubby wheelpants that looked like they could handle fairly rough terrain yet still look at home on an airport ramp. This is a simply equipped airplane but it had a very modest price point for an all-metal aircraft. Sky Tractor by Green Eagle was tucked in a corner of the indoor exhibit tent; I almost missed it. This single place Part 103-capable powered parachute entry boasts a 36-horsepower four stroke Kohler engine. It looks lighter than most powered parachute because it's closer to a four-wheeled powered paraglider. Cleverly designed to allow reasonably easy fitting of a jump seat, Sky Tractor would then have to be approved as an Experimental Amateur Built aircraft. Sy Tractor is very modestly price barely north of $10,000 depending on options chosen. Last but by no means least was an pre-release appearance by WingBug as this new device prepares for market in 2017. Because the product is undergoing final configuration changes leading to a design freeze, I don't want to be premature. I will have more information to follow in an article as the new season arrives and Wing Bug is ready to hit the market. Wing Bug is a stand-alone device that can clamp securely to any Go-Pro mount. You'll probably stick it out on a wing, away from influence by prop blast. It wirelessly (not via BlueTooth) sends air data, attitude, and heading info (ADAHRS) to the WingBug app on an iPhone or iPad. This is not simply a GPS gizmo or flight navigation app. For example, to provide airspeed, WingBug has its own pitot tube. It looks slick, can be used on certified aircraft, and may prove to be game changer. I'll have more early next year. 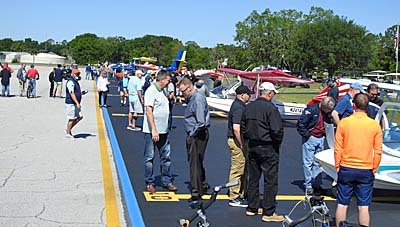 The first-ever DeLand Sport Aviation Showcase finished on a high note with a sold-out flock of vendors giving kudos to event director Jana Filip and her team. I spoke to most exhibitors and heard zero complaints. By itself that’s rather unusual. Perhaps they were cutting the new show some slack but more likely their enthusiasm was because the show had indeed been well executed. At every airshow I’ve attended vendors seem hard to satisfy about foot traffic. By afternoon each of the three days, visitors seemed to thin, nonetheless most airplane vendors reported good qualified visitors. Several companies reported “solid leads” developed at the event and apparently a few sales occurred Attendees also seemed to enjoy themselves in the abundant sunshine and 80-degree temperatures of early November. The event ran 3-4-5 this year and has already set dates for next year with an expectation of similar weather. 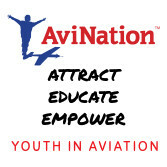 Read More About: Aero Adventure, Inc. Dynon Avionics JMB Aircraft s.r.o. We all know the Aventura line of formerly ultralight-based amphibious light aircraft, dating back 20 years. Recently, Alex Rolinksi took over the company as the new owner and he details some plans as the company becomes re-enegized. Alex, an A&P and longtime pilot, gives us some general ideas about prices and they are to be celebrated as the costs are about as low as an seaplane can be. Hear and see the line on this video. An earlier Aventura model flies over the Rockledge, Florida airport. Looking tempting to northern enthusiasts still shoveling snow, William Lacomba's Aventura II floats in the clear water near Puerto Rico. Does the LSA and light kit aircraft world seem somewhat obsessed with seaplanes? Certainly, it appears where a good bit of the most innovative thinking is occurring. However, to observe that is to focus only on the newest designs, the most innovative of which have yet to hit the market and may be years away. For pilots who want to fly today, Aero Adventure is one of those companies you should keep in mind. 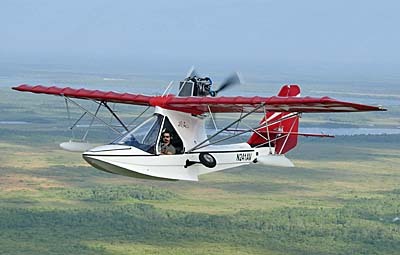 Besides the available-today quality, the DeLand, Florida-based company has a seaplane the rest of us can afford. Can you believe average kit prices in the mid-$50,000s and starting below $49,000? Even if you have not sought out this company with a long history, the brand may seem familiar and that sense may bring a recent memory of another sort. Yes, it was an Aventura that probably stalled, claiming the lives of two Aero Adventure team members at Sebring 2015. Such a severe event deals a body blow to a small company. Yet owner Alex Rolinski reported that the team has reassessed and regrouped and are forging ahead ... certainly as their departed associates would have preferred. "It made quite an impact on all of us," said Alex. "You can't plan for that sort of thing. You don't imagine, 'What could go wrong and cause such an accident?'" Following the tragedy, Alex R, his operations manager Alex Gutierrez, and their associates, rolled up their sleeves even higher and dove into their work. Work can be good therapy. "Over the last year we completely redid the assembly manual," said Alex Rolinski. He reported that all drawings have made the transition to Solid Works, a high end computer-aided design program that provides engineers — builders also benefit — with scalable drawings that can be examined in fine detail to assure better fit and finish of completed kits. "Our kit build process is better than it's ever been," Alex said, using construction of sub-assemblies that build upon one another. He noted that even though the Aventura and its preceding models — date back to the Buccaneer — kit instructions today are a major improvement from those from earlier producers of these designs. "We fixed many flaws in the early designs and their assembly instructions." Alex also stated that all the redesign and Solid Works efforts were done in conformance with ASTM standards for Special Light-Sport Aircraft. "We may do a SLSA version one day," Alex said, and meeting ASTM standards now will prove very helpful to that goal. It can also assure buyers of the kit-built present-day versions. Aero Adventure promotes the Suzuki AM-1300 and the 117-horsepower AM-1500 engines from AeroMomentum (see more about this engine in our video with supplier Mark Kettering). Full kits with all airframe components, engine, and basic engine instruments provided through an EIS start at $48,700 in early 2015; please contact the company for exact figures when you may be interested. "Typical owner-customized models run $55-56,000," added Rolinski. The company is working on a configurator for their website to help prospective customers price exactly what they want. Alex reported that 166 airplanes are flying under the Aventura model name. In 2014, the company delivered a dozen kits and said interest is growing. When I asked about all variations in the airplane, dating back to the earliest Buccaneers, Alex believes around 1,000 kits have been completed, although he observed prior company records were not as complete as he'd prefer. 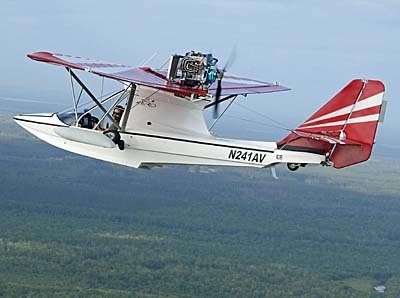 An Aventura kit seaplane can do real duty. For example, Ms. Tanille DeLair has flown her Aventura — which she named "Juliette" — more than a thousand hours. 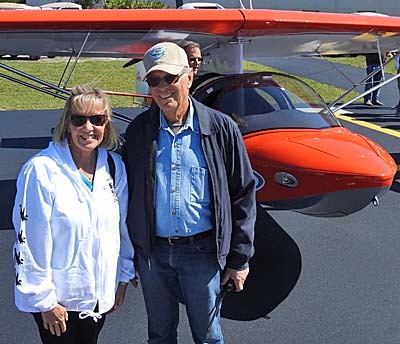 A Florida resident, she has often flown her seaplane to and from New York and helped her boyfriend obtain his Sport Pilot certificate in her Aventura. They've made several flights over to the Bahamas. 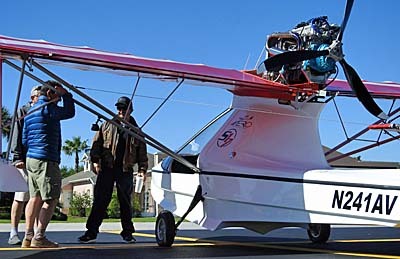 Her airplane uses the Rotax 912 and can achieve lift off from water in just six seconds. By any measure, that's a terrific performance. Does the LSA and light kit aircraft world seem somewhat obsessed with seaplanes? Certainly, it appears where a good bit of the most innovative thinking is occurring. However, to observe that is to focus only on the newest designs, the most innovative of which have yet to hit the market and may be years away. For pilots who want to fly today, Aero Adventure is one of those companies you should keep in mind. 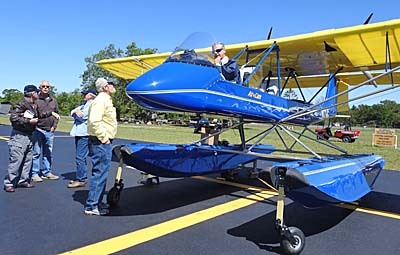 Besides the available-today quality, the DeLand, Florida-based company has a seaplane the rest of us can afford. Can you believe average kit prices in the mid-$50,000s and starting below $49,000? Even if you have not sought out this company with a long history, the brand may seem familiar and that sense may bring a recent memory of another sort. Yes, it was an Aventura that probably stalled, claiming the lives of two Aero Adventure team members at Sebring 2015. Inside Aero Adventure's new quarters. The city of Tavares, Florida ought to be feeling good about their effort to become their adopted name: America's Seaplane City (FA1). The city built a fine facility and seaplanes are using it. 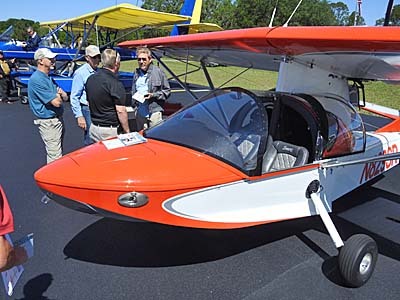 Yet the strongest measure of their success may be that the city, located about 45 minutes northwest of Orlando, has attracted not one but two seaplane manufacturers. I've written about Progressive Aerodyne and their SeaRey several times. We've done video with Aero Adventure since Alex Rolinski took over the operation. Recently, we were hosted by Alex Gutierrez as we paid a visit to their new factory following a laborious move from Rockledge, Florida to Tavares. In 2013, this a tale of two men named Alex and a familiar brand in the light kit arena. The longtime friends got together in central Florida after Alex R purchased the rights, designs, and inventory of Aero Adventure. While Alex R continues his work in the banking business, he tapped his friend to manage the refreshed enterprise. In a sign of true friendship Alex G willingly departed the western USA to help his old buddy. Rolinski is a longtime pilot, an A&P mechanic, and did service in the Air Force as a Flight Engineer. Both men seem highly motivated and ready to do more with this long established company. 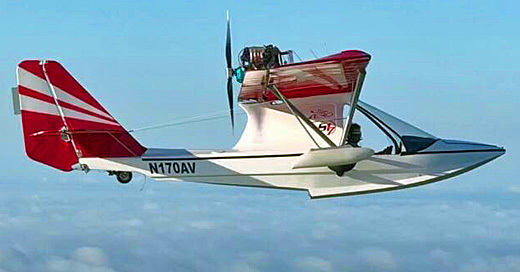 Long ago, Aero Adventures (under a different company name in those days) created the Buccaneer one and two place ultralights. Steady evolution lead to the Aventura and the collection of old and new aircraft resembling the original makes one of the early success stories in what was then the ultralight industry. The company under various leaders built more than 1,000 airplanes. Of that fleet Alex Rolinski reported that more than 160 are the two place Aventura II versions that today form the heart of the business. However, he added and Alex Gutierrez reinforced that a single place model is also available and they expect to put more time into developing it. Why? Well ... price is important to many potential buyers. So let's summarize. 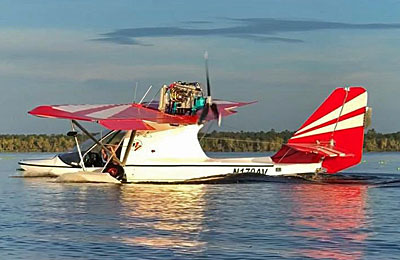 In the world of seaplanes expect to spend considerably more; 25% or more is not uncommon to go from a land plane to an amphibious float-equipped version. If you evaluate such aircraft, even in the LSA space (and it'll be a great deal more for a certified seaplane), prices begin at around $150,000. Yet here is Aero Adventure offering a two-place airframe kit for $25,000, with Rotax 582 engine for about $33,000. 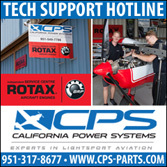 If you go whole hog with the Rotax 912 or Viking engine, you might lay out as much as $70,000 ... less than half what you might otherwise spend. Of course this is not an ASTM-compliant LSA and you'll have to build the airplane. However, price-conscious buyers recognize these are more affordable choices for an airplane that boasts more than 20 years of history. Alex R and Alex G both indicated they will also pursue a Part 103-capable version, however, you may need to shop for an engine as the Rotax 447/503 they'd use is no longer in production (fortunately plenty of used engines are available; this will further restrain the cost to get airborne). When we visited Aero Adventure, we were shown around by Business Manager Alex Gutierrez. Jumping into aviation to help his friend, I was impressed by his depth of knowledge in only a few months. Alex G helped with the move and though they still have work to sort out lots of parts, tooling, and details, their progress looked good. The factory floor had airplanes in for updates or maintenance and they benefit from their own paint booth (photo). With more than a thousand airplanes out in the field, Aero Adventure has a business foundation. Among their developments, they've fitted the Florida-based Viking engine (video) and have more plans to further the enterprise. Meanwhile, Alex G refines the inventory and is at work on marketing and other duties. Both young fellows, they've established a Facebook page to keep interested pilots and former customers advised. They also send out an informative newsletter; you can contact the company to sign up for this. 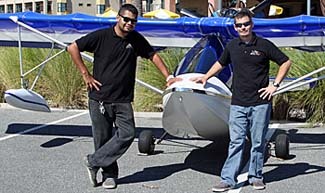 We'll have more on Aero Adventure in Tavares; click back soon! The city of Tavares, Florida ought to be feeling good about their effort to become their adopted name: America’s Seaplane City (FA1). The city built a fine facility and seaplanes are using it. 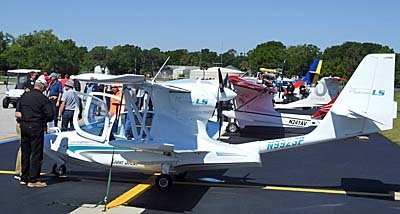 Yet the strongest measure of their success may be that the city, located about 45 minutes northwest of Orlando, has attracted not one but two seaplane manufacturers. I’ve written about Progressive Aerodyne and their SeaRey several times. We’ve done video with Aero Adventure since Alex Rolinski took over the operation. Recently, we were hosted by Alex Gutierrez as we paid a visit to their new factory following a laborious move from Rockledge, Florida to Tavares. In 2013, this a tale of two men named Alex and a familiar brand in the light kit arena. The longtime friends got together in central Florida after Alex R purchased the rights, designs, and inventory of Aero Adventure. The City of Tavares, Florida opened this impressive seaplane base in recent years. A new optional cowling surrounds the new Viking Honda-based engine. Basic airframe assembly takes a reported 250 hours. Modern features and 110 horsepower will make quite a pair on the Aventura II said the company. Icon Aircraft receives a high percentage of the attention paid to LSA seaplanes. They've worked hard on marketing and been quite successful; their Facebook page has nearly 300,000 "Likes!" Yet, as I've written, this is a growing subset within the LSA industry with several interesting designs already flying plus new ones to come that are really going to widen people's eyes. However, some of that remains in the future while we have present-day success stories. If you want a seaplane you can afford and you want it soon, you have several choices, for example: Progressive Aerodyne's SeaRey and the hot little SeaMax, both of which are SLSA approved, plus Edra Aeronautica's Super Petrel LS, and in the world of light kits, don't forget another longtime player, Aero Adventure. The latter Florida company recently reported news. "Here We Come Tavares," exclaimed a recent newsletter from Aero Adventure! "We are delighted to announce we are officially up and running at our new location in Tavares, Florida." The company said their move started in spring this year from their longtime location in Rockledge, Florida. Reporting that it took all of summer 2013 to get fully moved, owner Alex Rolinski said, "This move has been chaotic to say the least. We have been received by warm, hospitable people such as Tavares City Manager, Bill Neron, and the friendly folks at Al's Landing. We are more than honored to be part of the growth that is happening all around this city." 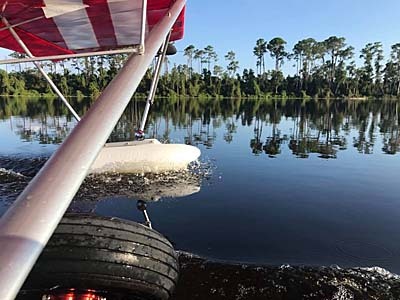 A few years ago, the city of Tavares — about an hour northwest from Orlando — established a new seaplane base (photo) and proclaimed themselves "America's Sea Plane City." With Progressive Aerodyne only minutes away and with the arrival of Aero Adventure, the claim is gaining momentum. Even Icon took a look at the city, but it appears that company will locate elsewhere. Aero Adventure has remained an Experimental Amateur Built (51%) kit aircraft company. The kit goes back a long way, originally called the Buccaneer, though the changes have been so plentiful that the connection is only one of history today. At Sebring 2013, we caught up with Alex and shot a video in which he tells watchers about his acquisition of the company, although he did not know then about the move to Tavares. He also told us how many are flying and spoke of his ambitions to take the company forward in various ways. One effort recently came to a fruition. The company's newest addition is their Aventura II V, with the "V" evidently representing the choice of powerplant. "We are getting ready to officially introduce our newest addition to the Aventura line of amphibious aircraft." Alex went on to note that the Aventura II V still offers the classic features of the design such as two side-by-side seats with dual throttles, retractable landing gear for amphibious operation, BRS emergency airframe parachute, and numerous other options. Now, he said the Aventura II V is fitted with a 110-horsepower Honda Viking Engine. Alex detailed that the Viking is, "fuel injected, water and oil cooled, has less noise and vibration, is very reliable, and boasts low maintenance." He added, "The Honda Viking is a perfect pair to the Aventura." The pictured cowling is available as an option and lends a sleek look to Aventura. We also shot a video about this engine at Sebring that will help you understand its differences. Congratulations to Aero Adventure, on their move and the new model! Icon Aircraft receives a high percentage of the attention paid to LSA seaplanes. They’ve worked hard on marketing and been quite successful; their Facebook page has nearly 300,000 “Likes!” Yet, as I’ve written, this is a growing subset within the LSA industry with several interesting designs already flying plus new ones to come that are really going to widen people’s eyes. However, some of that remains in the future while we have present-day success stories. If you want a seaplane you can afford and you want it soon, you have several choices, for example: Progressive Aerodyne’s SeaRey and the hot little SeaMax, both of which are SLSA approved, plus Edra Aeronautica’s Super Petrel LS, and in the world of light kits, don’t forget another longtime player, Aero Adventure. The latter Florida company recently reported news. “Here We Come Tavares,” exclaimed a recent newsletter from Aero Adventure! UP & AWAY - With gear retracted, this pretty Aventura II is seen climbing away from a water launch out of a lake nearby Arnet Pereyra's Florida factory. BACKGROUND SHOT - The newly completed Aventura II in the foreground is pretty but the background tells a story. If you look closely, you'll see several kits ready to ship. GEARED UP - If this isn't enough bells and whistles for you, you'll have to investigate an F-16 or something. This buyer wanted the works and it appears he got them. REPLACEMENT HULLS - Arnet Pereyra now also manufactures the Highcraft Aero-Marine Buccaneer line of ultralights under an agreement with Highcraft owner John Gruener. Owners of these models will be pleased to hear that Arnet's new Aventura hull fits well on the older Buccaneers. CRITICAL FUNCTION - Some of the many components Carlos Pereyra got right include the seals between the hull and retractable main gear. Nonetheless, a bilge pump is standard equipment. VERTICALLY EQUIPPED - Prominent in both appearance and in the standard equipment list is this brand new BRS-1200 parachute in the new Vertical Launch System configuration. Arnet Pereyra provides this as part of the base price. FLYING COP - Florida's Volusia County sheriff's department liked the Aventura II so much they now utilize one in law enforcement and search-and-rescue efforts. BUILDING GUIDES - Many of the aluminum parts employ these reference examples which are carefully labeled as part of the company's quality process. GO JUICE - With a 12-gallon fuel system, the Aventura II has some range. With the optional cargo deck over this structure, you can carry baggage with you (assuming your weight and balance check is careful). PARTS APLENTY - With adequate financial backing, Arnet Pereyra can ship kits from stock. Here you see a large storehouse of components all ready for crating. If you've never flown an airplane on floats, you've missed a glorious experience in flying. Good as any ultralight on floats may be - and that means "quite excellent" in my opinion - even those pilots with that experience may have missed the unique sensation of a boat-hulled ultralight. With a few thousand hours in my logbook covering everything from foot-launched hang gliders to twin-engined Barons, I can honestly say my absolute favorite hours are spent in one of two ways: first is soaring flight, but a close second is warm summer day flying in an ultralight floatplane. It just doesn't get any better. Having stuck my personal opinion into this article, I must tell you about a most promising company and their 2-seat floatplane, the Aventura II. 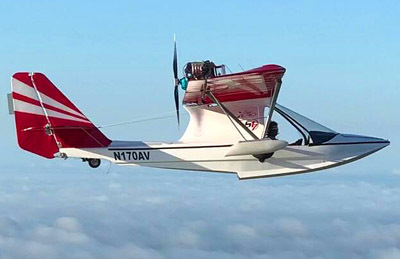 Since Arnet Pereyra exploded into the ultralight scene in 1995, this new company has filled out their line of floatplanes with a roomy and fun 2-seater which deserves a close look. 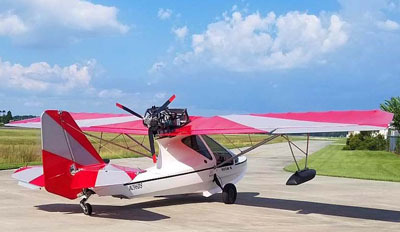 New From Arnet Pereyra Both their single- and 2-seat Aventura models bear a striking resemblance to Highcraft Aero-Marine's Buccaneer ultralight amphibian. The Buc', as it was affectionately known, won a strong following and for years was the only boat-hulled amphibious entry among ultralights. The similarity of the Aventura models to the Buc' is no surprise as several key employees of Arnet Pereyra have backgrounds at two former ultralight manufacturers that used to manufacture the Buc' - Advanced Aviation and Keuthan Aviation. So, who is Arnet Pereyra anyway? Sunglasses impresario-turned-aviation-financier Greg Arnet is one of the company's four principals. Carlos Pereyra is another and it is their names which come together at the central Florida manufacturing company. A South American expatriate, Pereyra is the main designer behind the new offering. Pereyra is held in high regard for both his design abilities and his concern for building quality equipment. Several family members work with him in Arnet Pereyra and their skills seem to complement his in a very useful way. Two other key players bear mention. 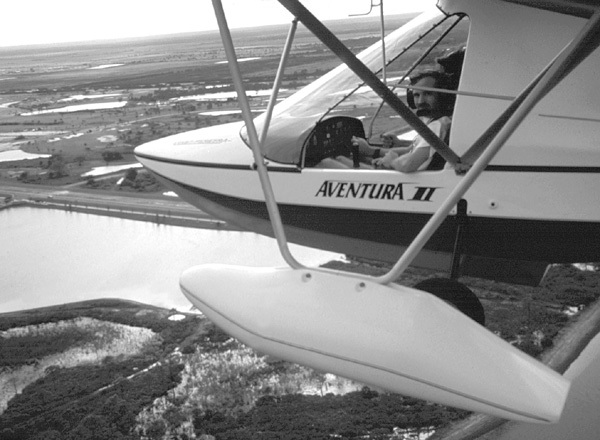 Though he's now left the firm to build Aventuras (and other aircraft) for customers, former "front man" Steve Darrow was a key figure along with Craig Lark, the last of a quartet that gave birth to the new Arnet Pereyra company. Adequate capital is apparently available to Arnet Pereyra. Two backers funded the new company well enough that it is now housed in brand new quarters and can put kits on the shelves for quick delivery. In the bumpy world of ultralight aviation, immediate kit availability can be rare. This suggests Arnet Pereyra will continue to be a player for some time. Whenever you can combine good financial resources with talented designers and quality employees, the result should be dandy aircraft. As we take a more intimate look at the Aventura II, you might end up considering purchasing this floatplane. Close-Up View Let's go fly! I'll bet you'll become infused with my excitement. Entry begins as you sit on the hull side rails and swing your legs into position. A structural tube supports you as you put full weight on the lip of the hull. Certainly, this is no more gymnastic than entry to most ultralights I've entered, and it's better than many. You must swing your legs into position but with the 2-seater's broad cabin, leaning a bit into the opposite seat makes this somewhat easier. Once seated on the well-padded seat, and before my co-pilot Steve Darrow joined me, the cockpit felt extremely wide. The 2-seat Aventura is like sitting on your living room sofa. The rudder pedals were aimed back at me with a fairly raked angle. Nonetheless they were comfortable with outstretched legs as mine were. An aluminum floor pan near the pedals supported my heels without putting unnecessary pressure on the hull. I entered the Aventura on land at the Arnet Pereyra factory. I never did a water entry/exit, but expect that the lower position of the Aventura relative to the water and probable need to step up to a dock would present more physical challenge. Engine startup was simple with no tug of war with a pull handle. A twist of the electric start key switch cranked up the 66-horse Rotax 582 engine. Ground steering proved good as I taxied to the far end of the field for takeoff. The Arnet Pereyra airport is an older facility which probably once sat by itself with open areas all around. That isn't the case today. The airport is hemmed in rather tightly with developments and forested area. To the west, the strip is open but on the other three sides, you have little recourse for an emergency landing should a problem arise. None did. However, I was more than content to let Darrow handle the takeoff chores for this first departure. All went well and we were soon headed to an enormous open area of fresh water to the northwest of the factory airport. On this large body, I was able to execute numerous water landings and takeoffs, and afforded that joyful opportunity to fly so low over the surface that the hull occasionally skipped the lightly wind-whipped lake. Pereyra has done his homework on boat hulls with help from Aero Comp, an experienced float builder located on a neighboring field. The Aventura hulls work so well that the company began selling replacements to former Buccaneer owners. After a few skips and goes, I allowed the bird to slow to a halt in the water. Though she sits rather low in the water, she was highly stable and felt comfortable. In rough conditions, you'd surely take on a little water, but you don't have to land on rough water (unless you're ditching). After all, an amphibian can be taken to land as easily as water, assuming you've got power. Following a quick stop, the 2-place Aventura's next test was slow water taxi steering. In the huge lake, I could do what I wished and so made a series of 90° turns to see how responsive she was. Steering in water proved adequate, though the single-seat Aventura is understandably more agile. Downwind taxiing in a floatplane is a unique experience if any amount of wind is blowing. In short, floatplanes always want to orient into the wind. Only prop blast over the tail and continued movement keeps you headed downwind. The Aventura II worked quite well, possibly because the beefy engine gives lots of air movement without overworking the powerplant. Boating around is fun but flying is better. It was time to let the bird have her head. In moments, she pointed into the wind. After a close look for floating debris - one sure way to spoil the takeoff event - and assuring adequate distance before any obstacles, I goosed the throttle and we started moving briskly. The Aventura with its potent liquid-cooled Rotax 582 climbs authoritatively, even with a relatively short wingspan (28 feet) on the model I flew for this report. The factory now offers a longer wing (30 feet 8 inches), which will do several good things for a modest expense of additional weight: Her takeoff run is shortened to perhaps 200 feet (it's really hard to measure this on water), she'll climb faster and start doing so sooner, and the stall speed is lowered. I simply cannot overemphasize the pure fun of flying this plane. 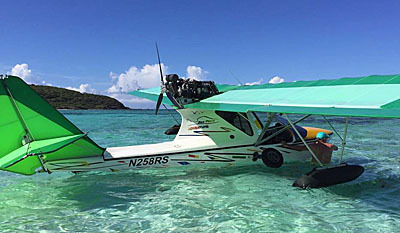 True of other floatplanes as well, water-based flying in warm climates has a special quality that is hard to duplicate. As Darrow and I glided by many lovely homes built at the water's edge, I renewed my fascination for this kind of flight. For a Minnesota boy like me, it can bring meaning to all those 10,000 lakes for which that state is famous. But this was warm Florida. Talk about enjoying ourselves! The air was pleasantly warm, neither of us was getting buffeted by wind blast, and protection was excellent from the large windscreen. Adding more throttle after a mini-tour of the local homesites, we rose swiftly to altitudes where I could explore more Aventura potentials. Aventura With Altitude Handling rates good marks for a 2-seater. The company's single-place machine is far more able to dart around the sky. In comparison, the Aventura II lumbers a bit. Since this one probably weighs more than the average, I must admit the handling is better than average. The control forces are reasonably light, and control harmony was very good. I felt roll was a little better to the right, but then, this is typical of pusher ultralights. Dutch rolls (coordination maneuvers which bank about the longitudinal axis) went well to moderate angles. I was able to perform dutch rolls satisfactorily on this first flight, providing a positive impression. Steep turns in the Aventura II revealed good stick range in pitch. A little extra rpm kept altitude about where I began, one measuring stick of turn efficiency. Investigating basic stability, I discovered full-power stalls were uneventful. Always a positive attribute, the Aventura II's nose never dropped through. Idle thrust stalls showed only the very mildest of breaks and I found no wing dropped regardless of direction. The central Florida lake scenery once again captivated my attention. Fortunately, the Aventura II has great forward visibility and on my left side I could look behind me easily, checking the tailplane. However, I couldn't lean far enough to check the tailwheel position. While I was twisting about in my seat, I recalled an earlier Aventura complaint: the amphibs come standard only with lap belts. I much prefer 4-point harnesses though some seaplane pilots say you must be able to escape quickly in the event of water ditching (assuming a loss of flotation). This may be valid, but at least you should take the company up on optional shoulder belts. (In keeping with that seaplane operation philosophy, I guess, Arnet Pereyra's land plane model comes standard with shoulder belts.) Cycling the landing gear lever up and down while airborne showed it to be superior to the older Buccaneer version. That's good! Without practice, I was unable to perform this vital function in the Buccaneer II. I realize technique will permit it but if you don't have the knack, you may not accomplish it at all. The Aventura II retract mechanism benefits from a linkage with lower friction and gives a good tactile feel for locking into position. Nonetheless, get some tips on doing it before you have to; and then practice it repeatedly until you're comfortable. Fortunately, while airborne the gear will literally fall into the down and locked position thanks to a simple overcenter arrangement. In the water you must reach down and push the mains to a locked feel before you drive the amphibian up on the beach. It seems unnecessary to say it but when landing on water, make sure the gear is up. Landing in water is a fascinating experience when you don't do it regularly. Yet you'll want to skip the experience of landing gear down in water as it is entirely possible to swamp the aircraft. Conversely, landing gear up on land is much less fearsome. In fact, a gear-up technique can be useful if landing in an emergency. A skidding stop may be far preferable to wheels which can't handle rough terrain and threaten to flip the plane. On wet grass the landing may not seem much different than a water landing, except you'll get no water cushion. In the Aventura II, I used the common technique of setting up a landable attitude and holding it right onto the water. Such a method is very useful on glassy-smooth water where your depth perception is deceived. A potentially enormous benefit is that you can nearly always land directly into the wind on water - and the wind lines on the water give you plenty of reference in strong enough breezes As with the single-place model I flew earlier, I was able to execute flare landings by employing the same technique one does on land. If your technique is good enough, you can save the hull from unneeded abuse while slowing more quickly When I hit the throttle, the Aventura II smoothly came off the water like the water fowl she is. Ah, such a sweet feeling. Loaded For Fun Seaplanes or floatplanes aren't your cheapest aviation toy, although compared to any certified floatplane, the Aventura II represents pocket change. Admittedly, your pockets will have to be reinforced to carry that much change but then, look at all the standard stuff that comes with the Aventura II. (Contact the factory for any changes before you make a purchase). 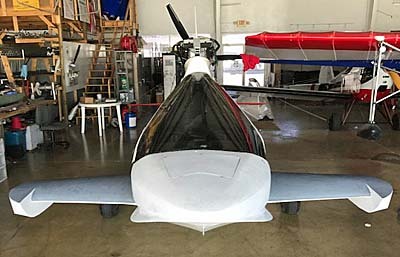 You'll get all the beautifully formed fiberglass parts - and these guys are good at fiberglass work; it is some of the best you'll find in aviation. You also get the sewn Dacron wings, tail, and "body sock." This will save you many hours of dope and fabric work plus it will save many pounds of paint and finishers. 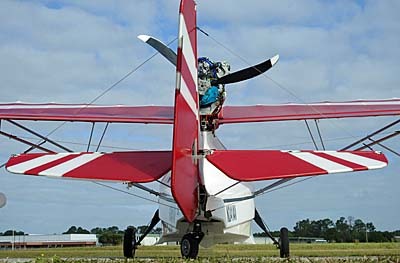 You get streamlined struts, the retractable gear system which includes the steerable tailwheel, and wide aluminum wheels. A radiator cowling is standard as is fixed rudder trim and adjustable elevator trim. The tail can quickly fold. 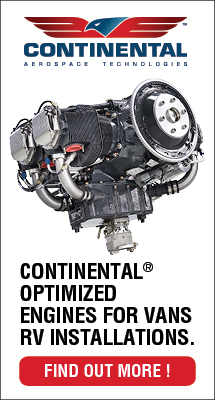 Aventura II's standard engine is the Rotax 582 with dual CDI and "B" gearbox. The bird also includes prop, instruments, instructions, and a key safety element, a standard ballistic parachute (worth more than $3,000 all by itself). All this will cost you $22,900 and at such a price, I feel the Aventura II is an excellent buy. If you use the Ultralight Flying! 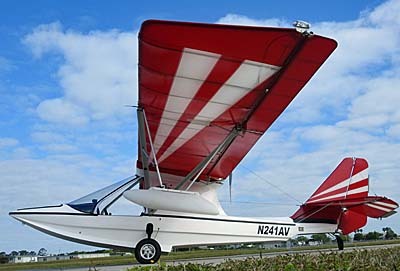 Buyer's Guide and add to other 2-seat ultralights options like an amphibious float system, ballistic parachute and the other standard goodies, I believe you'll find a lot of 2-seat ultralights can easily run upwards of the $23,000 price tag of the Aventura II. In addition, the Arnet Pereyra seabird is a package deal, all put together the right way. On other aircraft, you become something of a designer to cobble together all the right parts. I have to tell you one more thing. I work next to Wipaire, one of the largest float builders in the world. 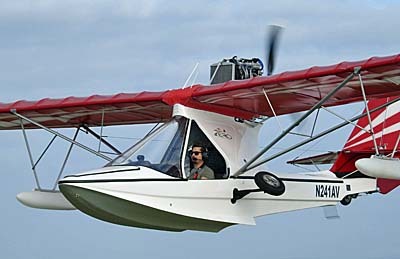 Amphib floats alone for a general aviation aircraft are priced thousands of dollars more than the entire Aventura II aircraft kit. Naturally, if you are determined to spend lots more on your personal Aventura II, Arnet Pereyra has a long list of options. My check pilot, Steve Darrow - now an independent entrepreneur building Aventuras for customers - estimates the average build time from kit to be about 200 hours, though this obviously varies widely from builder to builder. Yet the Aventura II is a bolt-together kit that shouldn't be too tough, though you may want advice about things like skinning tightly-fit ailerons. My impression from following the Arnet Pereyra company for a couple years and after visiting the factory is that this company is well-financed and as well-grounded as any ultralight producer. One thing I can be pretty confident in saying: Fly the Aventura II; you'll like it. Having now flown both single- and 2-seat models from Arnet Pereyra, I think these planes provide the chance to enjoy some of the best type of flying life offers. Standard Features Fiberglass hull/upper deck/ body sock, reinforced tubular construction, streamline struts, landing gear retract system, steerable tail wheel, 8-inch aluminum wheels, brakes, ballistic parachute, streamline radiator cowling, 12-gallon fuel tank, clear Lexan windshield, fixed rudder trim, elevator trim tab, double surface wings, quick folding tail, 2-color fabric, foam seat, ignition switches, airspeed indicator, altimeter, hourmeter, tachometer, EGT, water temperature gauge, compass, electric flaps, bilge pump. Spanish and English spoken. Pros - Design may look familiar (like a Buccaneer II), but it's a new plane from a new company. Roomy and capable; a lot of good can be said about this new but proven plane. Familiar construction to ultralighters. Beautiful hull work. All fiberglass is superb. Works very well as amphibious model. Excellent capacity for occupants and some luggage. Pros - Many goodies are standard: electric flaps, retractable gear, trim, bilge pump, a good complement of gauges, and a ballistic parachute are part of the price. Electric starting was nice on the test plane. Cons - When you have a lot of systems, you must learn to manage them; this will take more time and not spending it may cost you. Look at the cockpit photo - you'll see lots of levers and controls. Pros - Big boys won't be squeezed together. Even some cargo can be carried if occupants weigh less than 215 pounds each. Entry is reasonable by first resting on side rail. Reach to panel and all controls is excellent. Seats are very comfortable. Windscreen protection is excellent. Cons - Many seaplanes advise only lap belts to allow escape if upset in water; personally I prefer the optional shoulder belts. Seats don't adjust. No other negatives. Pros - On ground or in water, steering is very reasonable thanks to steerable tailwheel and rudder. A wide, low posture makes the Aventura II very stable on the ground, and in the water it might just be even better. Good forward visibility and some upward visibility to the side allows adequate traffic checks. Cons - While steering is good, turn radius is wider than average - plan ahead. This bird is heavy, you must also plan your stopping. Ground clearance is slight. Downwind taxiing in a seaplane takes practice. Pros - Basic takeoff and landing operations are straightforward. Short water runs attest to a good hull design. Flaps will help steepen your approach path. Slips are easily achieved. Though you may never plan an off-field gear up landing, a boat hull can be safer than gear on rough fields (though damage may result). Cons - A heavier bird like this demands more attention to speed and space requirements. In an amphib with retractable gear, you must remember what surface you'll use for landing - and put the gear in the appropriate position. Remember, "there are only two kinds of pilots|"
Pros - Very good control response among 2-seaters; even "good" when compared to more agile single-seaters. Very good control harmony makes for quick transitions from other aircraft. Crosswind capabilities are excellent (though you shouldn't need them on larger lake landings). Steep turns went well with good stick and rudder range remaining. Cons - Roll rate isn't fast (like a lot of 2-seaters). Retracting gear definitely requires acquiring some good technique and then practice. Adverse yaw is clearly present. No other negatives. Pros - Amphibs aren't noted for their blazing speeds, though boat-hulled ones do quite well (e.g., 70 mph cruise). Climb is certainly adequate given the weight of this seabird (about 500 fpm with a Rotax 582). Low flying over the water is excellent, simply superb - partly because hull works so well should you touch down inadvertently. Docking is simple with the high wings and stable water operations. Cons - Endurance is lower, range is less with a Rotax 582; 12 gallons will last little more than a couple hours depending on operation. You're pushing a lot of plane through the air, so more power is required to hold altitude. Pros - Stalls, whether power-on or -off, went very well. No wing drop tendency noted. Accelerated stalls merely went to mush mode. Longitudinal stability was normal and dampened quickly within three oscillations. Power response was neutral to positive (acceptable for high wing pusher engine mount). Cons - Some adverse yaw must be anticipated. No other negatives discovered. Pros - You can get one! | meaning kits are in stock. Factory workmanship appears excellent; stems from an attitude to give a buyer good value. A base price of $22,900 includes a standard ballistic parachute. This plane can deliver most of the fun of flying an ultralight floatplane. Factory has earned good owner remarks for technical support. 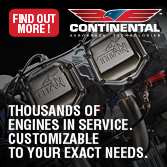 Cons - A license and FAA inspection are required. Relatively new company, though no complaints have been directed my way. If you’ve never flown an airplane on floats, you’ve missed a glorious experience in flying. Good as any ultralight on floats may be – and that means “quite excellent” in my opinion – even those pilots with that experience may have missed the unique sensation of a boat-hulled ultralight. With a few thousand hours in my logbook covering everything from foot-launched hang gliders to twin-engined Barons, I can honestly say my absolute favorite hours are spent in one of two ways: first is soaring flight, but a close second is warm summer day flying in an ultralight floatplane. It just doesn’t get any better. Having stuck my personal opinion into this article, I must tell you about a most promising company and their 2-seat floatplane, the Aventura II. 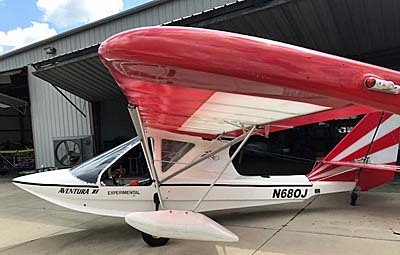 Since Arnet Pereyra exploded into the ultralight scene in 1995, this new company has filled out their line of floatplanes with a roomy and fun 2-seater which deserves a close look.